Lykke means ‘happiness’ in Danish and I did the pattern after I read “The little book of Lykke” by Meik Wiking. The book inspired me to search for the small things that make me happy and to let go of the things that restrict my creativity. I abandoned quite a lot of social media platforms and stick to the ones that promote creativity and positive thinking. It was maybe not the best decision businesswise but the best for a creative soul that needs sanity and an environment free from negativity. I hope you enjoy the pattern as I did and feel free to ask when you need some assistance. This pattern is ideal for a centre focus for a bedspread, small table cloth of large cushion. This week we start with rounds 1-10. The CAL consists of 43 rounds. So week 2 will be 11-20, week 3 will be 21-30 and week 4 will be from 31-43. It is written in American Crochet Terminology. Difficulty: Relative easy, but not for beginner. 52 cm x 52 cm but it may be larger if your tension is looser. With Purple Pink and 3 mm hook, work 6 ch, ss into the 1st ch to form a ring. Rnd 1: 3 ch (= 1st dc), 15 dc in the ring = 16 dc. Fasten off. Rnd 2: with Raspberry; join in any dc, 4 ch (= 1st dc + 1 ch), (1 dc, 1 ch) in every dc to end. Fasten off. Rnd 3: with Peach; join in any dc, 6 ch (= 1st dc + 3 ch), 1 dc in the same st, 1 dc in the next 1 ch-sp, 1 dc in next dc, 1 dc in the next 1 ch-sp, *(1 dc, 3 ch, 1 dc) in the next dc, 1 dc in the next 1 ch-sp, 1 dc in next dc, 1 dc in the next 1 ch-sp; rep from * to end, ss in 3rd of beg-6 ch. Fasten off. Rnd 4: with Baby Yellow, join in 3 ch-sp, (1 sc, 1 ch, 1sc) in the same sp, 3 ch, 5 dc tog over the next 5 dc, 3 ch, *(1 sc, 1 ch, 1sc) in the next 3 ch-sp, 3 ch, 5 dc tog over the next 5 dc, 3 ch; rep from * to end, ss in the beg-sc. Fasten off. Rnd 5: with Blue Canard; join in the eye loop of the 5 dc tog, 1 ch, 1 sc in the same st, 1 ch, 6 dc in the next 1 ch-sp, 1 ch, * 1 sc in the next dc tog st, 1 ch, 6 dc in the next 1 ch-sp, 1 ch; rep from * to end, ss in the beg-sc. Fasten off. Rnd 6: with Raspberry; join in the 1st dc, 1 ch, 1 sc in the same st, 1 sc in the next 5 dc, 1 hdc in the next 1 ch-sp, 1 hdc in the next sc, 1 hdc in the next 1 ch-sp, *1 sc in the next 6 dc, 1 hdc in the next 1 ch-sp, 1 hdc in the next sc,1 hdc in the next 1 ch-sp; rep from * to end, ss in beg-sc. Fasten off. Rnd 7: with Blue Canard; join in the 3rd hdc, 1 ch, *[(1 sc in the next 8 sts, 2 tr tog (1 tr in 3 ch-sp of rnd 4 and 2nd tr in next 3 ch-sp of rnd 4) (skip the hdc behind the st)]; rep from * to end, ss in the beg-sc. Fasten off. Rnd 8: with Baby Yellow; join the 1st sc, 1 ch, 1 sc in the same st, 1 hdc in the next sc, 1 dc in the next sc, (2 dc in the next sc) twice, 1 dc in the next sc, 1 hdc in the next sc, 1 sc in the last sc, 2 ch, skip 2 tr tog, *1 sc in the next sc, 1 hdc in the next sc, 1 dc in the next sc, (2 dc in the next sc) twice, 1 dc in the next sc, 1 hdc in the next sc, 1 sc in the last sc, 2 ch, skip 2 tr tog; rep from * to end, ss in the beg-sc. Fasten off. Rnd 9: with Peach, join in the 2 ch-sp, 1 ch, (1 sc, 5 ch, 1 sc in the 2 nd ch from hook and in the next 3 ch, 1 sc) in the same sp, 5 ch, skip (1 sc, 1 hdc, 2 dc), 1 sc in the next 2 dc, 5 ch, skip (2 dc, 1 hdc, 1 sc), *(1 sc, 5 ch, 1 sc in the 2 nd ch from hook and in the next 3 ch, 1 sc) in the next 2 ch-sp, 5 ch, skip (1 sc, 1 hdc, 2 dc), 1 sc in the next 2 dc, 5 ch, skip (2 dc, 1 hdc, 1 sc); rep from * to end, ss in beg-sc. Fasten off. Rnd 10: with Raspberry; join in the 1st ch (of the 5 ch-petal point), 3 ch (= 1st dc), 1 dc in the same st, 2 dc in the next 3 ch, 1 ch, 2 dc in the next 4 sc, 1 sc in the next 2 dc of rnd 8, 3 ch, skip 2 sc of rnd 9, 1 sc in the next 2 dc of rnd 8, *2 dc in the next 4 ch (the 5 ch-petal point), 1 ch, 2 dc in the next 4 sc, 1 sc in the next 2 dc of rnd 8, 3 ch, skip 2 sc of rnd 9, 1 sc in the next 2 dc of rnd 8; rep from * to end, ss in top of beg-3 ch. Fasten off. Until next week… happy crochet! Hi Frances, I am aware of the fact that so many require a video to assist them finding their way through a pattern, but I do have a problem in terms of time available. I am a freelance designer for three magazines and I am doing quite a lot of workshops as well as designing a new one for the upcoming year. Unfortunately I will not be able to provide videos at this stage. If somethings happens along the way that spare time is available, I will really consider it. What a lovely pattern, so enjoying it, easy to follow. Can’t wait to carry on. Thank you. 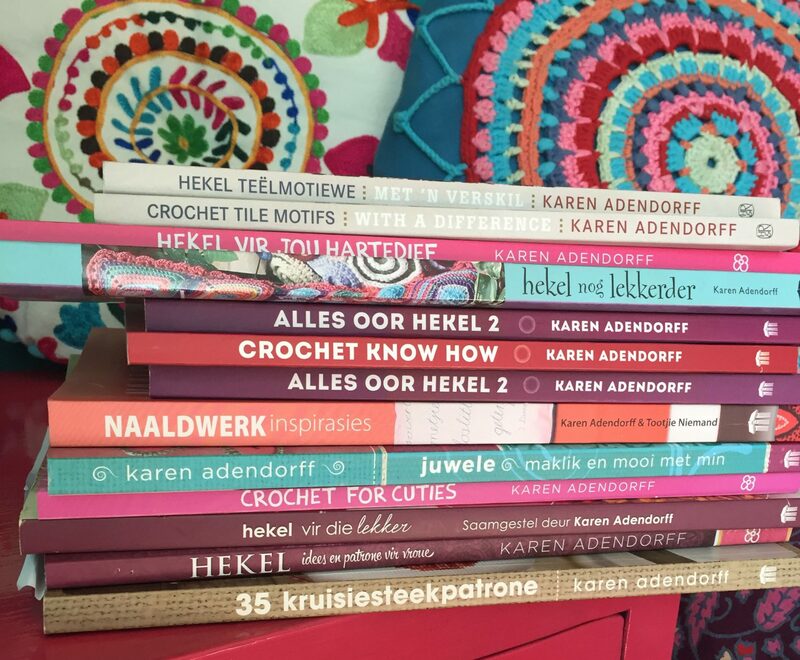 Hi there Karen – it’s Inge from EL – loved your class in Stellenbosch & your book you sent to us. I would like to print out the Lykke square pattern but can’t seem to do so from my iPad – do I have to use a computer to do so? I re-did the rose mandela in Moya & it’s looking much better! Your crochet patterns are addictive to say the least! Keep up the great work & hi from EL! Wonderful! Can’t wait to see it.